Luke 1:68-79 — Praise for God’s plan of mighty salvation. Zechariah’s prophetic song over the forerunner, John. Malachi 3:1-4 — A messenger will prepare the way for the Lord. When He appears He will come to refine and purify. Philippians 1:3-11 — Prepare for the day of God’s work completed in us. Paul prays with joy for the believers in Philippi with a view to God’s eternal purpose for them. The messenger of the Lord will prepare the way and then suddenly the Lord, the Refiner, will come to His temple. The word comes to John son of Zechariah, to call people to repentance and prepare the way for the One to come. Christians in the Early Church are reminded that God’s work in us is always a ‘work in progress’, with its completion date the day of Christ Jesus. 68 “Praise be to the Lord, the God of Israel, because He has come to His people and redeemed them. “Praise be” — Benedictus in the Latin translation. “His people… redeemed” — Zechariah is correct about the Jewish people, but His perspective does not extend to God’s desire for inclusive salvation, Luke 3:6. “Horn” — of a powerful animal, a ‘mighty salvation’, Ps. 18:2. “His Holy covenant… to Abraham” — although the original promise to Abraham had a focus on the land, this now emphasises the people of the land. 74-75 and to rescue us from the hand of our enemies, and to enable us to serve him without fear in holiness and righteousness before him all our days. “Rescue us” — the people of Israel wanted freedom from physical, Gentile enemies, the Romans. God’s plan through His Son Jesus was for spiritual freedom from sin, from Satan and from death. “My child… a prophet” — at this dedication and naming of the baby as John, Zechariah prophesies over Him. John was the last of the OT prophets and was called by Jesus the greatest, Luke 7:28. “Rising sun” — the Messiah is described in the OT as the sun rising and dispelling darkness, Isaiah 9:2, 60:1; Mal. 4:2-5. “Path of peace” — or the way of the Lord: God’s purpose is people finding peace with God through faith in Christ Jesus, Romans 5:1. 1 “I will send My messenger, who will prepare the way before Me. Then suddenly the Lord you are seeking will come to His temple; the messenger of the covenant, whom you desire, will come,” says the Lord Almighty. “My messenger” – a play on the name Malachi. This messenger is Isaiah’s “voice in the wilderness”, Isa. 40:3 which the NT understands as the ‘Elijah’ of Malachi 4:3, the role which John the Baptist fulfilled, at least at the first coming of Christ. It was the custom in that culture for a king to send a messenger ahead to address obstacles to their visit – one way of seeing John the Baptist urging people to repent and prepare for the greater Messenger to come. 2 But who can endure the day of His coming? Who can stand when He appears? For He will be like a refiner’s fire or a launderer’s soap. “The day of His coming” – a picture of judgment and also purifying. The launderer’s work with lye soap and beating with sticks was not gentle; neither was the heat needed to raise the dross of impurities from molten metal. 3-4 He will sit as a refiner and purifier of silver; He will purify the Levites and refine them like gold and silver. Then the Lord will have men who will bring offerings in righteousness, and the offerings of Judah and Jerusalem will be acceptable to the Lord, as in days gone by, as in former years. “Purify the Levites” – the term messenger was usually applied to prophets and priests – and the priestly class of the Levites, who were supposed to be an example in serving at the altar, will be purged of their unfaithfulness. 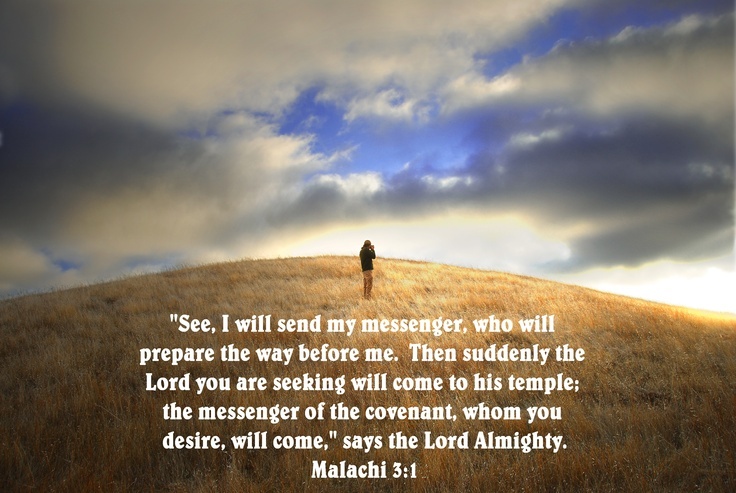 IN PRACTICE Malachi’s message here about the Lord and messenger of the covenant focuses on the refining and purifying aspect, particular for its guardians, the priests and Levites. Bring that into today and the NT reminds us, James 3:1, that teachers will be judged more harshly. For those given privilege and responsibility, more is expected, Luke 12:38. The priests and religious leaders of Jesus’ time were not proclaiming God’s purpose but thwarting it. Jesus is poised to come again, and the more that reality becomes clear, the more it is plain that He simply wants His Church back. He wants it to be His church, holding His values and proclaiming the unashamed message to the various empires of man, that He is the way to salvation into the kingdom of God. Creating our own version of temple and priesthood may be more accessible for us – but it’s not what He had in mind. It’s not the New Covenant way of knowing God that the Early Church began to work out. Our honouring His first coming, and preparing ourselves for His return, must involve pruning back what doesn’t belong, to reveal a church that Jesus will recognise. QUESTION What simple changes would bring your church closer to Jesus’ intention? 1-2 In the fifteenth year of the reign of Tiberius Caesar – when Pontius Pilate was governor of Judea, Herod tetrarch of Galilee, his brother Philip tetrarch of Iturea and Traconitis, and Lysanias tetrarch of Abilene – during the high-priesthood of Annas and Caiaphas, the word of God came to John son of Zechariah in the wilderness. “Herod tetrarch of Galilee… Philip tetrarch of Iturea. When Herod the Great died in 4 BC his sons Antipas (Galilee) and Philip (Iturea), also Archelaus, not mentioned, succeeded him as tetrarchs ruling quarters of his former kingdom. Also mentioned by Luke, Lysanias, the fourth tetrarch and the overseeing Roman governor Pontius Pilate. 3 He went into all the country around the Jordan, preaching a baptism of repentance for the forgiveness of sins. “Preaching a baptism of repentance” – John heralded the coming Messiah saying that people needed to repent of their sins and prepare spiritually; the response and demonstration of repentant intention was water baptism. 4 As it is written in the book of the words of Isaiah the prophet: “A voice of one calling in the wilderness, ‘Prepare the way for the Lord, make straight paths for him. “Prepare the way” – before a royal visit, workers would clear and level the road. The quotation from Isaiah 40:3-5 was associated with the Jews’ return from exile, Ezra 1-2, and end-times salvation. The picture for Jewish hearers was of another deliverance like the Exodus from Egypt. 5 Every valley shall be filled in, every mountain and hill made low. The crooked roads shall become straight, the rough ways smooth. “Every valley… filled in” – a poetic way of saying the Lord’s purpose will not be thwarted. There are also moral overtones. The humble and lowly are to be built up, the crooked changed, and the proud and arrogant, particular obstacles to God’s purposes, will be humbled. “All people” – Luke’s gospel was written with Gentile believers being added to the church in mind. All four gospel accounts quote Isaiah 40:3 but only Luke takes the quotation further: “…the glory of the Lord will be revealed, and all people will see it together.” Luke, a Gentile, asserts, from Scripture, that all people – not just those included in the original covenants – would see God’s salvation in Jesus Christ. It would be 20 years after the Resurrection, at the Council of Jerusalem, that this was recognised, a huge and controversial shift of attitude, see Acts 15, Galatians 2. “All… will see God’s salvation” – God’s intention, that His covenant people would act as a light and model of righteousness to the nations around them, was clearly set out by Isaiah, Isa. 42:6 and 49:6: “The Servant… is called… to be **a light for the Gentiles**…” “…He says, ‘You will do more than restore the people of Israel to Me. I will make you a **light to the Gentiles**, and you will **bring My salvation to the ends of the earth**.’ ” Luke also reports the aged, godly Simeon’s prophetic blessing at the dedication of Jesus, Luke 2:28-32 “…My eyes have seen Your salvation, which you have prepared in the sight of all nations, a light for revelation to the Gentiles.” The purifying of the Levites, Mal. 3:3, addresses their negligence of this important widening of the mission of God. IN PRACTICE Luke’s picture of John, the prophetic voice in the wilderness of Isaiah 40 is a call for us to be prepared for the expected order to be upset. The Jews expected their Messiah to come to them and deliver them, as their entitlement. We think of our church attendance and charitable actions, and feel we should be the ones lining the way for the royal visit. God often does things differently from our expectations. In recent years there have been increasing testimonies of how God shocks people that don’t really know Him with His love. We have been challenged by His perplexing grace to those we consider, in our judgment, rather undeserving as we hear stories of prisoners in jail receiving Jesus and Muslims of harsh views having visions of the Lord. This gospel passage emphasises our being prepared for His return in expecting – and praying for – people who are not like us, to begin to see His salvation. QUESTION Who, in our world and culture, are to us like the ‘Gentiles’ that Jews of Jesus’ time struggled to accept as a focus of His salvation? Paul prays with joy for the believers in Philippi with a view to God’s eternal purpose for them. 1 I thank my God every time I remember you. “I thank my God” – Paul is writing from closely-guarded imprisonment, but his tone is thanks and joy for what God is doing among others. 4-6 In all my prayers for all of you, I always pray with joy because of your partnership in the gospel from the first day until now, being confident of this, that He who began a good work in you will carry it on to completion until the Day of Christ Jesus. “Day of Christ Jesus” – His return. God (the Holy Spirit) initiates salvation, works the ongoing salvation in us needed beyond the change of heart of initial salvation, and will bring salvation for all to its conclusion on this future day. Paul writes with this longer, eternal timescale in view. 7 It is right for me to feel this way about all of you, since I have you in my heart and, whether I am in chains or defending and confirming the gospel, all of you share in God’s grace with me. “In chains or… confirming the gospel” – the Philippians stood with Paul and supported him practically and financially, despite the stigma of imprisonment in their culture. The partnership remained strong although Paul’s ability to “defend and confirm the gospel” seemed to have been removed by imprisonment. His perspective is that God is always “carrying on” the “good work” that He began through good times and hard. God always completes what he starts. 8 God can testify how I long for all of you with the affection of Christ Jesus. “Love may abound… in knowledge and… insight” – in knowledge of God’s Will and so able to move from the immediate picture and the judgments we make, to seeing the bigger picture of what God, in His unconditional love, is doing in others. 10-11 so that you may be able to discern what is best and may be pure and blameless for the day of Christ, filled with the fruit of righteousness that comes through Jesus Christ – to the glory and praise of God. “Pure and blameless” – questioning what will be found in us on the day of Christ’s return. Harbouring wrong attitudes, especially the judgmental or resentful kind, will bring the Lord’s censure — we are commanded to forgive, to show grace, to treat people better than they deserve and above all, to love. It’s only treating others as God treats us. “The fruit of righteousness” — not something we can achieve by any amount of effort or discipline. Rather, it is being yielded to the Holy Spirit, such that He can grow righteousness in us, from the inside out. IN PRACTICE God’s timescales can be difficult for us in a world where up-to-the-minute news is on the ‘phone in our pocket, ‘instant’ drinks and food offer to save us time and we can be in another country for a meeting and back again the same day. Having to wait is challenging for us, and the waiting for Jesus’ return that the Early Church seemed to measure in years is counted for us in millennia. With the benefit of hindsight, we can see that the good work begun by the Lord is taking a long time to bring to anything like completion: the world has got bigger and vastly more complex. The message of this epistle is to have faith in God for all the loose ends that we see. He will bring to completion the good work that He has started, whether that is in us personally or the mission of the church we are involved in or the bringing about of a just world order. QUESTION What does it look like, to be filled with the fruit of righteousness? PRAYER Lord, we want Your glorious return but we are so unprepared. Teach us to wait actively but also to willingly put right with You those traits which have no place in Your presence. Amen.